Do you ever feel like there are just too many things that you want to try cooking and/or baking? I know that in the world of foodies out there, I can’t be alone. I feel like my recipe “to-do” list is never-ending, and it doesn’t help that I keep buying more and more cookbooks. It has really become an obsession! I thought it was bad when we lived in Chicago, but since we moved to Tucson I think it’s gotten worse. Over these past few weekends we’ve been doing a lot of thrift store shopping. Kirk and I are on the lookout for a coffee table and/or some side-tables that we could refinish. You know, it would be nice if we didn’t have to keep putting our drinks on the floor when we’re in the living room. It would also be nice if we didn’t have to use our wood bar stools as bedside tables! Anyway, I think we have been to almost every Goodwill resale store in Tucson. Although we haven’t had any luck on the furniture front, I’ve brought home about 5 cookbooks over the course of these adventures (and don’t even ask me about kitchenware… I may have picked up a few stray pieces of colorful china, some glassware, and a fabulous orange enameled cast iron roasting pan from 60’s era Denmark). It’s amazing what you can find at a thrift store for just a few dollars! How can you turn down a beautiful Limoges plate (in perfect condition) for 99 cents? Back to my point. Browsing through my insane cookbook collection I find myself feeling overwhelmed by the sheer number of recipes and ideas that I want to try. I’m starting to notice that my natural inclination is to want to only cook sweets and baked goods, although I do force myself to venture into the realm of healthy savory dishes since that’s what I actually should be making on a more regular basis. I would like to think that I could live off of flour, butter, cream, sugar, and chocolate… but there’s a reason why we signed up for a CSA. Yesterday I ignored that fact. Veggies? Meh. I had leftover Green Tart to snack on, and that was good enough for me. On a whim I decided that I wanted to make use of the glassware I picked up over the weekend. Match that with leftover mascarpone and a recipe for creamsicles that I saw in one of my new cookbooks. What do you think we get? Above all other deserts, Tiramisu is the one I crave most often. If an Italian restaurant has it on their menu, I always try it. What can I say? It’s just my thing. After all, this is the second post related to Tiramisu that I’ve written in the last couple of weeks. 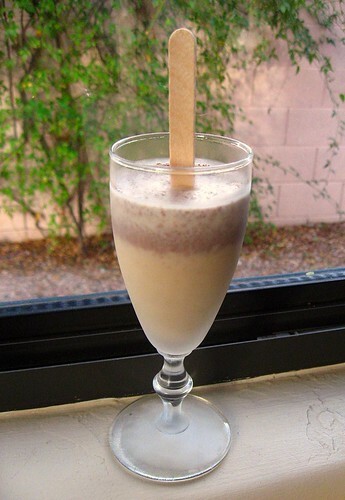 I have seen some recipes out there for Tiramisu ice cream, but I don’t think I’ve ever seen one for a popsicle (though this popsicle is really just shapped ice cream on a stick). Could it get better? I don’t know. Maybe. Anything can be improved on. But for a recipe that I just tossed together with absolutely no guidance except my knowledge of what Tiramisu should taste like, I think it turned out pretty good. And it looks so pretty. Doesn’t it? It was hard for me to leave these alone in the freezer all afternoon. I kept looking at them, wanting to just yank them out and eat them immediately. I used 4oz cordial glasses, and only filled them about 3/4 full (liquids expand as they freeze). I think these would be fun if they were made in tall shot glasses, or whatever other glass you might have that could be a good general shape for a popsicle (or, you know, you could use a real popsicle mold). 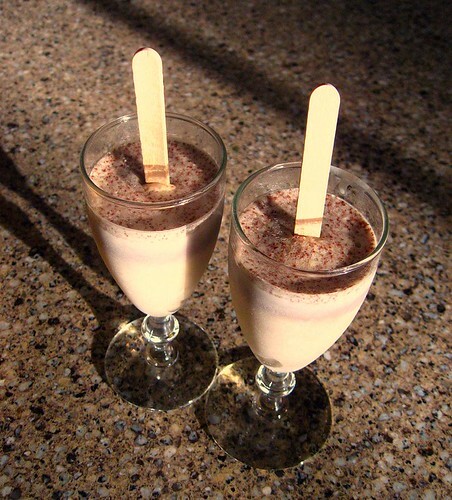 After we tried them last night, Kirk suggested that I could have just used this recipe to make straight-up ice cream. I agree that this could be a great traditional ice cream. But I just really liked how pretty they looked as fancy popsicles! 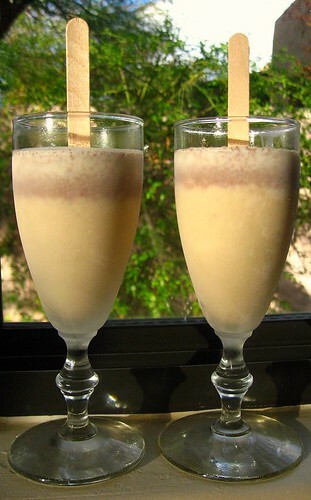 But this is to say that if you don’t have the patience to pour the mixture into little glasses, and then monitor them as they freeze so that you can insert the stick at the right moment during the freezing process, then I would just process this recipe in an ice cream machine and store it in a covered dish in the freezer. 2oz Shaved Dark Chocolate (I had a piece of solid chocolate that I shaved using my microplane). Pour the mixture into something with a spout (I poured it into my large measuring cup). This will make pouring it into small glasses soooo much easier. Fill your glasses about 3/4 full. If you’re using glasses like I did, you’ll want to put the glasses in the freezer (without their sticks) for a few hours until the cream starts to harden. The point here is that you want to make sure that when you insert the sticks, they don’t lean, fall over, or sink all the way to the bottom of the glass. The cream should be firm enough to hold the stick in place, but not to hard that you need to use heavy pressure to insert it. Once the sticks are inserted, let them freeze for several more hours until you’re ready to eat them! Pull them out of the freezer about 5 minutes before serving. 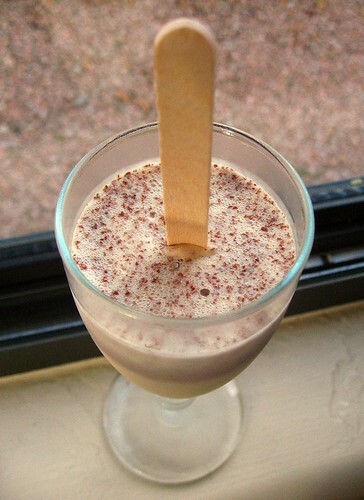 The cream that is in contact with the glass will need to melt slightly so you can pull them out. Emily, you are making my mouth drool! 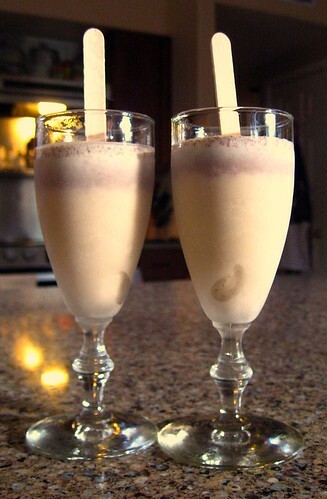 I do make a similar concoction but haven’t for a while … well maybe 5 years or so! Anyhow, how do you eat all this mouth watering food and remain slim? I would love that magic secret. Ha! There’s no magic secret – we just eat treats in moderation 🙂 We don’t usually eat all of our goodies ourselves, and I tend to make things in fairly small batches. Anything that can easily be shared comes to work with me for my colleagues (cookies, cakes, breads, pies, candies). Also, it probably helps that I go for a walk everyday over my lunch hour – if I didn’t I might be in trouble!